Incredibly, it looks like joggling lemons may have improved my joggling. Sometimes the road to glory is paved by ridiculousness. Yesterday, the day after joggling lemons for a few miles, I managed to break my previous record and joggled for 23.3 miles without dropping my juggling balls even once. Still, this is my longest interrupted(both running and juggling interrupted) run without drops, not my longest uninterrupted(continuous non-stop running and non-stop juggling) run without drops – that is still 15 miles. Without stops(of juggling or running), or with stops(due to traffic, quick bathroom breaks, water breaks) 15 miles without dropping has been my record. The weather was perfect yesterday, with temperatures in the upper 60s, and mostly cloudy. I ran north on the Putnam trail, then ran east to White Plains to get to the Bronx river trail which I used to run back south, doing a big oval. It took me 3 hours and 37 minutes to run 23.3 miles, at a 9:18 pace. The upper body exercises like push-ups and curls I did on the same day I joggled lemons may have also helped. I also kept tricks to a minimum, since I often drop while doing them. Like I said before, this wasn’t uninterrupted joggling, since I did carry them a few times for a few seconds when crossing busy streets, and I stopped to get some juice up in Elmsford, but still, I didn’t drop them even once while joggling. It feels miraculous. This shows how doing something ridiculous can improve athleticism. The challenge of joggling with irregularly shaped lemons may have improved my precision, so it was easier to joggle with my regular balls. It has taken me years to get to this point. Juggling/joggling is like playing a musical instrument, it requires a lot of practice to achieve proficiency. But don’t let this intimidate you. I remember when I couldn’t juggle at all, and when I finally could, I frequently dropped. When I first learned to joggle I couldn’t run more than 50 feet without dropping the balls. After finally going beyond 50 feet, for many months I couldn’t break the 0.3 mile barrier. I finally broke through 0.3 mile, and next thing I knew 1 mile was the new barrier. Then 2 miles. Then 5. Then 8. Then 10. Then 15. And now 23. 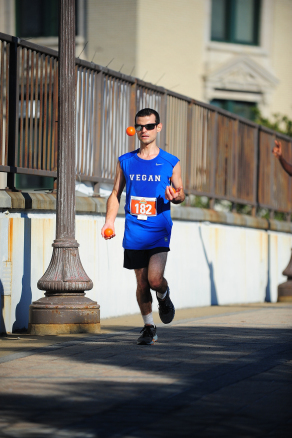 Years ago, I never would have imagined being able run 23 miles while juggling and not dropping the balls even once. You never know what you’re capable of until you try it. Truth be told, and this isn’t the first time I am saying this but I am not innately well-coordinated. In fact, I still think I am closer to a clutz than a well-coordinated person. This is largely why I didn’t play any sports in high school, not even the track team. I was the kid in gym class everyone laughed at because I couldn’t catch or throw. I hope this inspires you to be more creative with your fitness routine. Try new things, be ridiculous. You may be astonished by the results!